As the most cheerful season of all approaches, you may be down to just a few people on your holiday list. When shopping for singles this year, consider focusing on gifts that keep on giving, providing a feeling of safety and security that can last the whole year through. From Google Home to Amazon Alexa, smart home devices are evolving rapidly to deliver home experiences that make life better for single homeowners. A smart home hub can monitor everything from house temperature to appliance power usage, and provides real-time alerts delivered to a smart phone in the event that carbon monoxide is detected or there is a water leak. For a busy millennial with no time to shop, food delivery can be a lifesaver. While Blue Apron and similar celeb-inspired services provide fine dining experiences, plenty of food subscriptions services deliver faster, easy to prepare meal options. These can be perfect for seniors living independently, and reduce the risk of kitchen fires due to absent-mindedness. While we’re on the topic of subscriptions, knowing your single homeowner’s favorite things can help guide you in choosing another way to show them you care all year long. Whether their hobby is gaming with friends or just curling up with a good book, there’s a subscription for that. Just having a home security system deters burglars and can help keep single homeowners safer. Trends like geofencing make customizing home security even easier, and a complete set-up could be the ideal housewarming present for a new homeowner on your holiday gift list. Many Florida homeowners underinsure their homes, especially singles who may think they don’t own much worth insuring. Storms and thefts are always a possibility, so an endorsement to their home insurance policy could be the best gift you can give for added protection. Olympus Insurance offers Spartan Expanded Coverage exclusively to Olympus policyholders, with added protections for valuables and increased limits on standard coverage. It even covers business equipment kept in the residence, which makes it a great option for telecommuters. Any of these options can make it easier for single Florida homeowners, and could turn you into a hero for thinking about their needs. 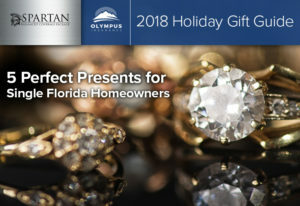 Whether your holiday list includes an independent senior or a single adult son or daughter who just made the big leap to mature homeowner, there’s a gift that will be perfect for their peace of mind – and yours.